Certificates | Shipcon sp. z o.o. 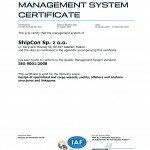 SHIPCON has implemented a Quality Management System certified by GL – Germanisher Lloyd since 2012. Our Quality Management System is certified in accordance with PN-EN ISO 9001:2008 standard.